ISLF has established a country office in Colombo, Sri Lanka. The purpose of the ISLF country office is to facilitate the work of ISLF in Sri Lanka and serve as a liaison office of the Foundation. The office of the ISLF is located in 28/3/1 1st Chapel Lane, Wellawatte, Colombo 6. Dr. P. Kandasamy was appointed the ISLF Sri Lanka Country Director. Dr. Kandasamy retired a few years back, after a period of more than 35 years of public service in the country as a Veterinary Surgeon. He has held many senior positions in Sri Lanka, such as Deputy Director (Planning), Provincial Ministry of Agriculture and Lands of the North-East Provincial Council and Deputy Director (Planning), Provincial Department of Animal Production & Health of the North-East Province. Figure- Dr. P. Kandasamy, ISLF Sri Lanka Country Director. 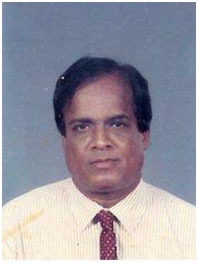 While serving as Deputy Director (Planning), Provincial Ministry of Agriculture and Lands of the North-East Provincial Council , Dr. Kandasamy coordinated and supervised the activities of the six departments, namely, Agriculture, Animal Production and Health, Agrarian Services, Lands, Cooperatives and Fisheries. He revived, revamped and rejuvenated the livestock and poultry farms and hatcheries in the North-East, namely, the Livestock Station at Uppuveli, Trincomalee, Hatcheries at Achuveli in the North and Sathurukondan, in the East (that were destroyed and devastated due to the war since 1983). Dr. Kandasamy is a member of the Lions Club of Colombo Circle, a Senior Consultant to Mahadeva Ashram, Kilinochchi, and was President of the All Island State Veterinary Surgeons Association, consecutively for two years. Dr. K, Sancheeswaran, a Veterinary Surgeon and a Food Safety Expert, was appointed the ISLF Sri Lanka Assistant Country Director. Dr. Sancheeswaran is currently the Director of Vet World (Pvt) Ltd., a leading and most trusted company in Sri Lanka, dedicated to providing animal care products and services. His profile will be updated soon.